Diabetes changed Jacob's life forever when he was diagnosed at age 11. In high school, Jacob started training to control his sugar levels. Now the gym is this teen's second home! I was always an average kid. I played soccer and basketball, but neither of them competitively. My life as an average kid would change forever when I was 11 years old and about to enter seventh grade (I have a late birthday). An annual doctor's checkup showed a large amount of sugar in my bloodstream, a symptom for Type 1 diabetes. So, we had to schedule an appointment at our local children's hospital. After a series of tests and evaluations they came up with the result. At 11 years old, I was diagnosed with Type 1 diabetes. My world was suddenly turned upside down. Seventh and eighth grade were very tough for me because it was hard to get my diabetes under control. During eighth grade, I decided to try something new and joined a gym. I began working out many times a week and I loved it. It really helped me manage my blood sugar levels as I stayed active. Then high school came along, and a new struggle was to be faced. I entered a dark era of depression and my life was going down a dark path. I received help, and by the beginning of my sophomore year, at 14 years old, I was doing a lot better. This is when I discovered boxing. I truly think boxing and training saved me. It gave me something to look forward to every day. It wasn't until the end of my junior year that I really started to hit the weights again. 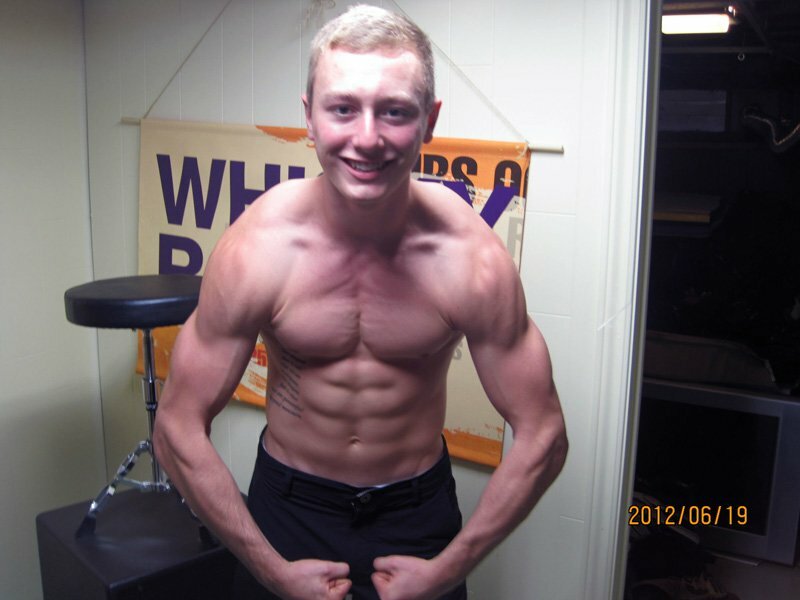 I lifted weights throughout the summer before my senior year. I was 16 years old and found the love for it again. I'm now 17 years old, and about to graduate high school. I continue to lift weights and train for boxing. Going to the gym is a huge part of my life. It gives me self-esteem, keeps me healthy, and helps me manage my diabetes. I just hope that people reading this will realize that you can make it through tough times, and having something that inspires you can make a big difference. For me, training is one of the most fun things to do. I include all the basic exercises that I think everyone should incorporate into their programs (except squats due to a bad knee). Of course, I change my program up from time to time, but currently this is what I'm on. My meal plan is pretty basic and consistent due to having Type 1 diabetes. Of course, from time to time it will change and I will indulge every now and again. This however, is an example of one of my average days. For me, supplements are a big part of my training regimen. I believe that proper supplementation will really maximize your results. I take all the basic supplements that I feel will do my body good. The sport of fitness allows you to gauge your progress every workout. I fell in love with it the moment I started going to the gym. There is just something that just drives me about knowing that it is in your hands whether you will improve or not. Are his back muscles starting to form a maple leaf? 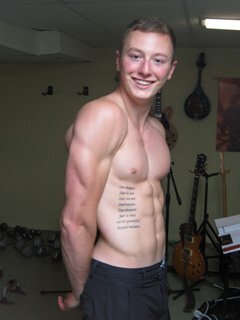 Either way, Jacob is one ripped Canadian! I just love every aspect of fitness. First and foremost, fitness keeps my diabetes under control. Every other positive attribute it gives is just gravy. The feeling you get when you hit that new weight, or you see yourself improving just cannot be compared to anything else. Most of my inspiration comes from within. I am a big goal setter and I will not stop doing something until I have reached the goals I have set for myself. My plan for the future is just to keep training hard and never lose sight of my goals. I always want fitness to be something that will be fun and rewarding at the same time. The most important tip I have for everyone is just to always believe in yourself. It is up to you how far you will push yourself, and if you constantly tell yourself you can reach success I guarantee one day you will. I am a big admirer of Phil Heath. I find that his symmetry and muscle structure is just unbeatable. 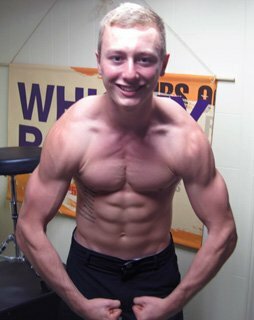 Bodybuilding.com has pretty much everything you need to reach your goals. In fact, I planned my whole workout with exercises I learned from the articles section. Bodybuilding.com allows me to gather information on new topics and exercises and the store also has a large variety of great supplements at awesome prices.